You see a map that contains territory of Ukraine. interesting map of Prymors'k 1 cm to 1 km for Garmin. detailed map of Zelenyy Gay with gps calibration free download. map of Zelenivka calibrated this. topographic map of Yurevka for gps. interesting map of Yelyzavetivka calibrated for Garmin. topographic map of Vyacheslavka 1 cm to 1 km for you. detailed map of Preslav 1 cm to 1 km here. detailed map of Podgornoye with gps calibration download for free. interesting map of Petrivka calibrated for gps. interesting map of Partyzany 1 cm to 1 km for Garmin. map of Orlivka for Garmin. detailed map of Obitochnoye 1 cm to 1 km here. interesting map of Novooleksiyivka download for free. actual map of Novaya Zelenovka calibrated for Garmin. actual map of Mykolayivka и OziExplorer calibration displayed. interesting map of Mar'yanovka 1 cm to 1 km presented. 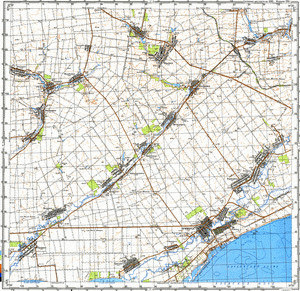 free map of Marynivka with gps calibration for gps.